New and improved, the new Destinator 2 distances itself in many ways from the previous version we reviewed (v1.72). The menu system is re-designed, bigger buttons allowing for finger pressing and a new 3D drive view is added as just a few of the new features. 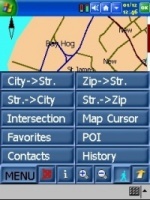 Destinator 2 on install gives you a map of the country with sectional maps and several ways on how to install the software to your Pocket PC. Destinator die hard fans will notice for the UK, the sectional maps have now changed slightly. 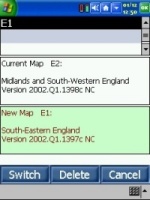 Maps E2a and E2b for the UK have been merged into a single map and the total size now for all 7 maps come in at 186mb. Like with Destinator 1.72, if you have two Storage Cards on your Pocket PC, you will only be able to install the maps to the first storage card. If you prefer to store the maps on Storage Card2, you will need to re-jig your storage cards temporarily by ejecting both storage cards, inserting SC2 first to be recognised as SC and you can then install the maps to what essentially is Storage Card2. Once you've finished, you can swap them back to how it usually is, you won't have a problem on the Pocket PC, but it's a minor frustration on install! PowerLOC have chosen to stay with their current offering which is a LeadTek 9531 GPS Mouse in SiRF mode. The LeadTek 9531 really is one of the more faster in-car GPS receivers, and it's good to see PowerLOC staying with what essentially is the best! 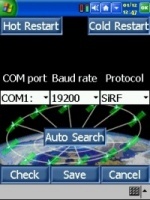 As in previous tests we have run, this GPS Receiver really is in a class of it's own when it comes to Pocket PC GPS Receivers and has very fast TTFF's. 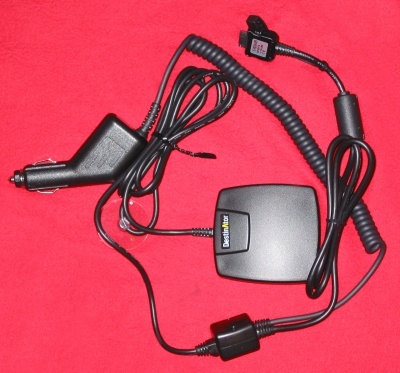 This GPS Receiver has become quite popular and is now being bundled with several other software packages, and PowerLOC really did choose well here. Check out our TTFF Comparisons for details on how fast this GPS Receiver is compared to others we have tested. One nice little touch, PowerLOC have included in the package a canvas carry bag with draw strings. This allows you to take the GPS Receiver with you when you leave the car. Just unplug it and place it into this bag. One thing we did feel that was left out of the standard package which really is essential was an in-car holder for the Pocket PC. 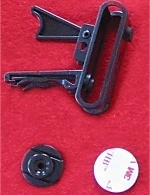 On PowerLOC's website you can purchase separately a Proclip cradle, or the Destinator Vent mount bracket (pictured right). The vent mount only costs $9.95, and really would be a welcome edition to the standard Destinator package. Perhaps this could be something that's included as standard in the future, and wouldn't increase the overall cost of the package by much. 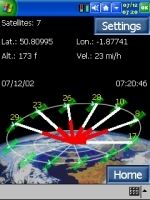 PowerLOC in Destinator 1.72 last year had the best Status screens going, and although many other GPS applications have had some very graphical GPS status screens, I still haven't found anyone that's managed to display a nice looking 3D view of the earth and the position of satellites it can see. 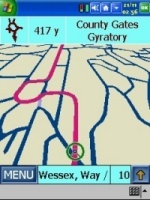 PowerLOC have aimed to keep the GPS Status screens the same in Destinator 2. A few cosmetic changes have been made, mainly larger buttons. Destinator 2 has quite a few nice new features. One of which is a much better menu system. Destinator 1.72's menu screens were fine if you were navigating with a stylus, and you could just about get away with using your fingers but it was difficult. 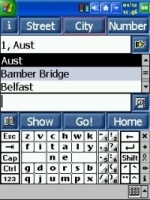 PowerLOC have made the menu buttons much larger allowing for ease of navigation in and out of the menus and this is greatly appreciated. Destinator's largest and newest feature is the 3D map. We've included some comparison screenshots between the standard 2D view and 3D view so you can see the differences. To start with, you might think the 3D view is a gimmick or a toy. We did at first, but once you start driving in 3D view, you will realise the full potential as it makes life a whole lot easier when driving and you will never want to return to 2D land again! Why is it we have to use a 2D map anyway ? We live in a 3 dimensional world, we drive 3 dimensionally, so why can't we have a map in 3D ? There's absolutely no reason whatsoever, and it's good to see PowerLOC taking the initiative here and taking mapping to the next level! 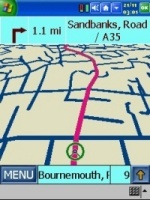 This really is a feature I would like to see in all new GPS products! 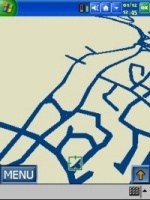 When driving with Destinator 2 in 3D mode, it makes adjoining roads actually mean something. Due to the perspective of the map, you get much more road layouts on screen and I found I could actually see where the next road I was approaching would take me. This helped on a number of occasions because I was able to sneak out of traffic congestion down a couple of side roads, and then come out a little further up the road. Magic! 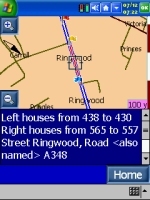 PowerLOC have taken the decision to leave street names off the 3D map where as they are displayed on the 2D map. Initially I thought this was a shame, but then after thinking long and hard about this, I think street names would clutter up the 3D map, so I think the right decision has been made here. Although you can toggle between 2D and 3D mode, perhaps a toggle on/off for street names might be a nice feature for future versions allowing you to make the choice yourself. As you can see from these 2D and 3D comparisons, you find yourself in some cases getting between 2 and 3 times more information on screen as you would compared to a 2D map. When driving in 3D map view, much to our surprise, it really isn't jerky and you don't see a slow down at all. The perspective on the 3D view really is awesome! I found myself not wanting to switch back to 2D mode! The only downside with the 3D mode is that you lose the extra buttons like Zoom, Information, etc. However this does give you much more space on screen which works well for the 3D mode. 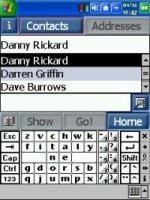 One thing that is solely missed in most GPS navigation programs for the Pocket PC is an interface into the Pocket Outlook contacts database. CoPilot was the only package that accomplished this until now. Destinator 2 now offers full integration, so you can pick up any of your contacts with ease and navigate to their locations. If you still prefer the manual way of searching for a street/town you can still do so by using City->Street, Street->City, Zip->Street, Street->Zip. This makes plotting destinations a breeze and really helps overcome the hurdles that other GPS Navigation products face. PowerLOC have really gone home re-designing the menu structure. You are now greeted by some nice large colour buttons for every function you need to configure. Simplicity is the key here! Routing will give you the option of choosing Alerts and Quick/Shortest. 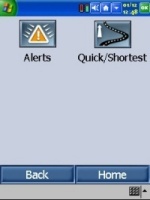 Alerts now gives you a great new feature which is to notify you verbally if you are over the speed limit. 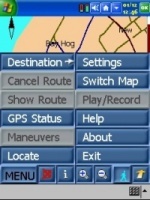 This is a feature that many GPS users have requested on various GPS Navigation programs for the Pocket PC, and PowerLOC have implemented it straight into Destinator 2. 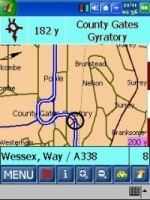 On our tests, we did notice that some roads were wrongly classified as part of the geodata, which did mean that even though you would be driving at 60mph on a road designated as National Speed Limit, Destinator 2 would constantly notify you at 50mph of being over the speed limit. We found Destinator 2 doing this mainly on dual carriageways where speed limits were most commonly 60mph. We have reported this to PowerLOC and they have confirmed this as a NavTech data issue. This new feature did come in handy though on lower speed roads with accident black spots where Police will consistently choose a location and use this as a speed trap site. 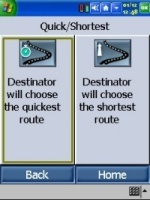 When having this enabled, Destinator 2 will re-calculate a route whenever you veer off the designated route. 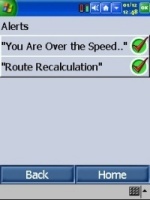 Although this feature is a welcome one in all GPS Navigation programs, there are times when sometimes you don't want auto route recalculation on, and it's good that PowerLOC included a toggle for this feature. 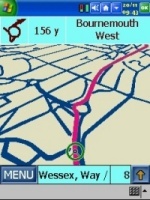 A common feature in most GPS Navigation programs, and one that is essential. Sometimes you need to change whether you are going to get to the destination in the quickest time possible, which in many cases will require navigation via motorways, or the shortest route, which tends to require a lot of cross country trunk road driving. 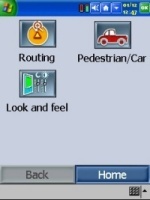 One feature that was available in Destinator 1.72 and one that is still available in Destinator 2 is the ability to switch between Pedestrian and Car modes. 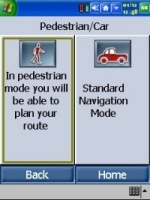 In Pedestrian mode you can plan your journey, and then switch to standard /car navigation mode to enable routing. 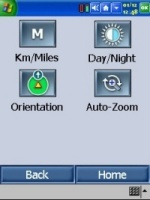 In other options you can find buttons for changing from Kilometres to Miles, changing the screen colours from Day to Night, changing the Orientation of the map, eg North Up and Auto-Zoom of the maps when in navigation mode. Destinator's driving instructions screen shows you a turn by turn instruction list. Each piece of information it gives you is quite large on screen which means you can only see the next four turns, however in most cases you really need large text. There's nothing worse than having to squint at the screen whilst driving to try and make out a road name and it is good to see the instructions being clear and concise and easy to read. You'll also notice that Destinator will give you a rough guidance on which side of the street house numbers are, which makes it much more easier to locate a house when at the destination. The maps in Destinator 2 are supplied by NavTech which are the same maps that both Navman and TravRoute uses, and appear to be very up to date. Unfortunately Destinator 2 still only has sectional maps, and there are no way of loading a single country-wide map, which means if you want to route from one location map to another it does cause a little problem. We posed this question to PowerLOC and they are looking at ways to allow you to create your own maps and hopefully this technology will be implemented in future versions of Destinator. 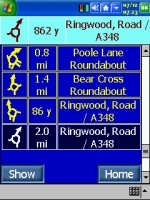 Currently, if your journey takes you between several sectional maps, and you know minor roads in your local departure area, but don't know local roads near the destination, you can always load the destination map and navigate directly to this, and this will work well. However, if you don't know local roads in your departure area either, and need help navigating, then you will find yourself having to create two journeys in Destinator. One from departure to the edge of the map, and another one from the start of the next map to the destination. To change maps, Destinator requires a complete unload and re-load of the application and re-agreeing to the license agreement. 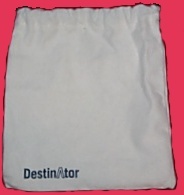 The routing in Destinator 2 follows on closely from the previous version. Routing is pretty good, and in most of the tests we threw at it, Destinator followed what we would call is the ideal quickest route. Strangely enough we did find one issue where we were asked to navigate off of a dual carriage way onto a roundabout and then back up onto the dual carriageway again. You do find these sort of issues in most routing software, and this problem seems to be in the geodata from Navtech as several other applications using Navtech data have experienced the same problems. Destinator's voice navigation is great. The female voice is soft, and very clear. However, Destinator's voice navigation files could do with being louder. When driving at motorway speeds we did find that audio files like "you are over the speed limit" were fairly quiet. The volume level on these audio files could be increased by around 30 to 50% to make the voice navigation easier to use at high speeds. 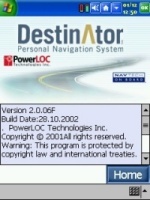 Destinator was the first navigation program on the Pocket PC we tested to include a single point journey. 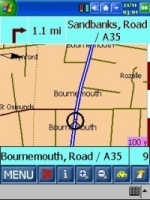 You don't have to set your departure, it knows where you are from your GPS co-ordinates. All you need to do is set the destination and it will navigate wherever you are to the destination. Many navigation programs have since included this feature as standard, and it's one that makes plotting your journey much easier. Destinator 2 follows on from the previous version with quite a few new features and re-designs. 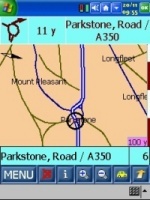 Destinator 1.72 was nice to work with, the maps consistent with very few errors, it's good to see PowerLOC have improved upon the product in general, and the User Interface, making navigating through the screens a breeze when driving. Voice Navigation is a little quiet at motorway speeds and could do with having the volume increased on the audio files. 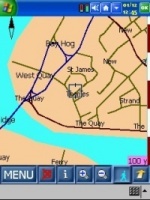 The best features of all though is the 3D map view, and outlook contact integration and to allow support for NMEA GPS Receivers which has certainly made Destinator 2 a superb product! To be able to drive the route in 3D mode, makes life easier, and less likely to miss a road turning. 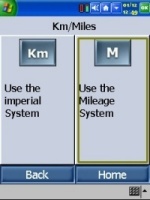 This is a feature that really should be included into all navigation programs! The one thing that really does let Destinator down is no country-wide single map. 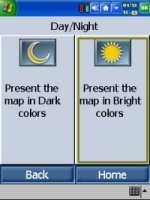 This is a feature that really is required, and with storage card sizes increasing and prices dropping, a 256mb CF card is now only around �65, so cost really isn't an issue here for the average user and with a single country-wide map would probably make Destinator the best navigation product around for the Pocket PC! Now the news gets even better for all you current registered Destinator users, as PowerLOC is offering an upgrade price to Destinator 2 for only $50 US Dollars which makes this offer a real bargain!